I’ve just finished helping my friend setting a simple online store for her last week, this project has been really an insightful experience for me, She gives many input to the design and response quick in every question i’ve ask, so development went fast. Without her input, the development wont be so quick, the only things that held us down is the product aren’t available when the website ready, so we have to wait a couple of days to fill the site with product pictures. The site sell Nursing covers for breastfeeding, bib for baby and diaper bags. The language that are used is Indonesian because she targeted the Indonesian market first, but to her affirmation she also confirm that she is capable in dealing with international buyers. The question that may pop-up in your mind is why does an online store doesn’t have a shopping chart? It’s because the nature of the online consumer here in Indonesia. Using credit card in an online environment are still rare here, many of the Indonesian consumer doesn’t believe in the security of the interwebs and the popular bank here also doesn’t have the support in online transaction, they do have internet banking but they doesn’t support retailer to use their bank service on the retailer site. So the solution? using the good old fashion of contact form, even so, in my experience there still difficulty in using it, in that position, the default comment form of WordPress coming in, to back-up it up i also use chat-box and Yahoo messenger status ID. wanna ask, how much is it if u sell it? 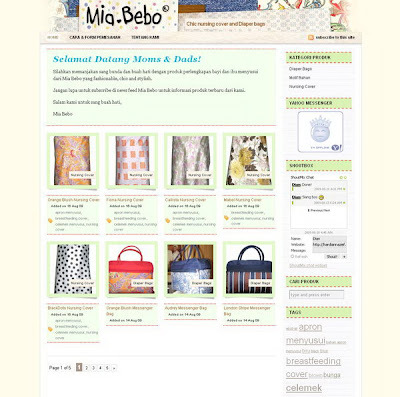 Miabebo website design or the product (nursing cover & diaper bags) ? just wondering… how much is ur fee to develop this kind of web..
pls send me email to let me know… so i can contact u latter..